Note: This post may contain affiliate links. See disclaimer section. Let’s be honest, our dogs deserve the best. They are a blessing in disguise for us. They take care of us when we are down and try their best to cheer us up. They lay beside us when we are sick and are ecstatic to see us come back home, even if we have been gone for only a few minutes. We can probably never measure or even imagine how much we mean to them. If we give them back half of what they have given us, we consider ourselves lucky. As our dogs give us their best, we have to give them our best too, and that includes taking the best care of them. One of the ways that we can ensure this is by taking care of their skin and coat. Dogs are heavily reliant on their coats. Irritations or problems in their skin can lead to health problems as well. Hence, make sure you give your dog a bath regularly and use the best dog shampoo available. You may be thinking about the different types of dog shampoos that are available in the market. To make it easier for you, we have listed down the best dog shampoo types so that you can at least narrow down your choice according to your dog’s needs. Don’t just take care of them outside, make sure their joints are healthy, too! Look into Pet Bounce Multivitamin. If your dog is suffering from a flea or tick problem, you should consider giving it a bath with this type of shampoo. Though the shampoo may eliminate the problem in one go if used properly, it is safe to use it a couple of times more in the next few showers to follow. Please do take note that this is not a permanent solution to the problem; having the dog treated by the vet might be better. Even these shampoos come in different varieties, so make sure that you choose the best one suited for your dog. If it is a puppy, choose the one which is recommended for puppies. Similarly, if it has a skin problem, choose the one that will not add to the problem. If your dog has or is prone to getting tick fever, it is best that you use this shampoo regularly. This type of shampoo technically does not need any water to use. All you have to do is apply it to your dog’s coat and let it be. The shampoo comes in a spray bottle for easy use and is also available in a powder spray form. It comes in a wide variety which you can choose from. Make sure to choose the one that will not negatively affect or damage your dog or its skin. If you are not comfortable with buying a new shampoo bottle every time, there are larger refills available for the shampoo. You will find a huge variety of medicated shampoos for your dog. Each shampoo will be catering to a different type of issue that your dog’s skin could have. It is the main reason why the ingredients of almost all medicated shampoos differ. If your dog is suffering from any skin problem, it is best to ask the vet about the type of medicated shampoo that should be used for the dog. The main purpose of a medicated shampoo is to treat skin problems that can be prevalent in your dog. There are various problems that your dog could be suffering from including rashes, itchiness, and dry skin. Medicated shampoos tackle these problems and leave the dog’s coat and skin shiny and rejuvenated. Make sure to pick the right medicated shampoo for your dog when on the lookout for one. Simply read the label before buying. These shampoos come in various sizes and varieties. For choosing one of these shampoos, you do not need to consult your doctor (only do so if your dog has a reaction from the shampoo). A dogs coat is the best part about it, and it is up to you to keep it looking soft, shiny and great. The shampoos are manufactured to ensure that the dog’s coat comes out looking amazing after the bath, and many accomplish that mission of theirs. If someone in your family suffers from allergies because of your dog, this is the best dog shampoo for you. Once you have applied the shampoo, it removes dander, which makes sure that the allergy problem goes down to the bare minimum. Every dog has a unique smell to it, and many people may find its odor to be irritating. A deodorizer is a shampoo that contains a strong smell, almost like cologne, and makes sure that it leaves your dog smelling the same for a certain period of time. The smell might die after some time. If you want a more permanent solution to that, there are many dog colognes available in the market as well. You can simply buy one of those and use them on your dog after its bath. Some shampoos already contain conditioner, so you do not need to worry about buying an additional bottle. A conditioner will not only leave your dog’s fur shiny and smooth, but if your dog has long hair, it will also help you take out the tangles that may be formed in its fur. In case you are still confused about the type of shampoo you should use for your dog, the best thing to do is to take it to the vet to get its coat and skin checked and buy the shampoo that the vet recommends. At least that way, you will know that you made a safe choice. If you are wondering about the best dog shampoo available in the market, you may want to consider the top three first before searching some more. Do take note that these shampoos are best suited for dogs with dry or irritable skin and coat. This shampoo is great for every type of dog, be it big or small. It is even suitable to use on pregnant dogs. This shampoo makes sure to properly clean and moisturize a dog’s coat, leaving it soft, smooth and shiny. It also helps relieve a dog from various irritants such as itching and dry skin. If your dog has a dry, breakable coat, this is one of the best dog shampoos to use as it makes that coat silky. The shampoo is made up of all natural ingredients, which ensure that no damage is caused to your dog’s skin or coat. It does not contain any soap either, which means that it does not let the dog’s eyes water. 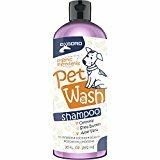 If your dog is suffering from allergies or has dry or sensitive skin, this is the perfect shampoo for it. Though the shampoo does not kill the fleas or ticks present in your dog, it will definitely not interfere with the treatments for these dreadful insects. You can also purchase the whole set of these products and use them together for maximum impact on your furry baby. It ensures that the dog’s fur is properly cleaned while moisturizing it at the same time. It stops the dog from itching because of dry skin. The shampoo does not allow tears as it doesn’t contain any soap. It is best suited for dogs undergoing any flea or tick treatment. The shampoo has no smell so does not leave a scent in the dog. It is a little difficult to lather up. Earthbath consists of a wide variety of dog shampoos, each of which is equally good in their own way and has a specific purpose. One of the generic ones is the Earthbath All Natural Shampoo. It is made up of totally natural ingredients. It is also a 100% biodegradable and cruelty-free product. The shampoo does not contain any soap in its ingredients, so it ensures that it does not irritate a dog’s eye during its bath. The shampoo also smells amazing. Once your dog has been bathed with it, its coat will smell great for a certain period of time, all thanks to the vanilla and almond oils present in the shampoo. The shampoo is very effective on a dog’s coat. It is also safe to use and can be gently applied to its coats. One of the best dog shampoo brands, the Earthbath All Natural Shampoo consists of all natural ingredients. This shampoo is also recommended by many vets as it is one of the best shampoos to cure dry skin and irritation. It is also effective in helping heal the skin of a dog. The shampoo is completely natural and does not have a strong smell. Easy to rinse, the shampoo does not leave behind anything on the dog’s coat. It also makes the dog’s coat shiny. It will suit your dog’s skin as it contains the vital ingredients which take care of its skin. It will suit a dog with sensitive skin. It has a conditioner mixed in it as well. If your dog is getting treatment for fleas, this shampoo is safe to use then as well. It will not sort out hair problems if your dog is suffering from one. This shampoo is completely organic, natural, and all vegan. It promotes skin care and gently treats a dog’s coat while making sure that it does not cause any harm to the environment. This shampoo is also one of the best dog shampoo recommended by vets. It takes great care of the dog’s fur and ensures that its coat is effectively clean and treated. It is easy to apply as well; all you have to do is use warm water to wet your dog completely and lather in the shampoo. It does not contain any soap, so it does not irritate or cause problems in the dog’s eye. The shampoo only requires a little water to rinse off. You can recycle the bottles as well; this is another step taken by the manufacturers to lessen its carbon footprint. Its formula is great for dogs suffering from sensitive and dry skin/coat. It moisturizes the fur, starting from the roots of the hair to the very top, while smoothing their skin. The shampoo brings back the shine to a dog’s fur. The shampoo itself has a very light smell, so when you wash your dog with it, it will leave little or no smell on its coat. The shampoo is easy to lather and can be rinsed off quickly. It is completely natural and organic. It soothes a dog’s itchy and dry skin. It is a “no more tears” product. You can recycle the bottle as well. The smell of the shampoo is very faint. The shampoo is a little expensive, especially if you are on a budget. Our dogs are one of the best creatures in the world and they truly are a blessing for us. It is up to us to ensure that we take the best care of them and provide them with the best. Therefore, by choosing the best dog shampoo for them, we are doing our part in taking great care of them.